Walmart had been developing and running more than ten distinct campaigns from multiple agencies to promote all of their holiday offerings. As a result, their work was being misattributed to other big box retailers compromising their efforts. They needed a platform that could handle all of their needs, inform and sell, and be unmistakably Walmart. So we created the Walmart Holiday Hub. In one studio, with two likable celebrity hosts, Melissa Joan Hart and Anthony Anderson, we created a talk show-like format that could talk food and tech as well as last minute sales. 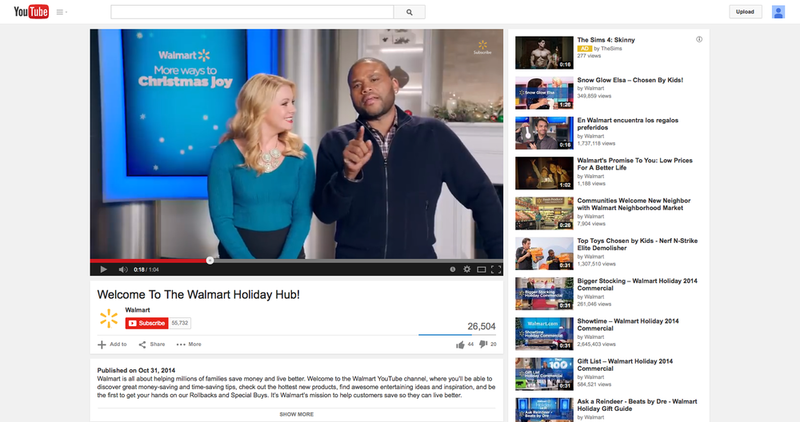 Hundreds of pieces of content later, the Holiday Hub was everywhere, across all platforms, and was incredibly effective, helping Walmart to its best ever holiday period in history. Which is saying something. Naturally all of the Holiday Hub videos were housed on YouTube and we carried through to Walmart.com to create a cohesive experience that all felt uniquely Walmart.